A huge thank you for the fantastic job you and your staff did at our wedding. The food was totally delicious and our guests were all very impressed. Your staff were amazing and Neil is an absolute superstar. Everything went swimmingly well and we had a wonderful wedding. It was perfect in every way and could not have gone better. We are very grateful. Next time we have an event we will most certainly give you a call. Wow, what amazing food and lovely staff! Thank you so much! The lady in charge of the evening was superb, please pass on our thanks. I just wanted to pop you an email to say thank you so much for the amazing food at our event. You and your team were extremely efficient- Neil was very helpful and attentive. The food was delicious and we had some great feedback from our guests. Thanks again for your help and look forward to working with you again in the future. Now that we have (more or less) returned to reality we just wanted to say a huge thank you to both of you for the fantastic food and service on our wedding day. We both felt totally relaxed and reassured from start to finish (the whole process, not just the day itself) and you were both so kind to us and our families. Particular thanks on that note, Julia, for your last minute veil attaching skills! Many people have raved about the food and one person has also said that it is the best food they have ever had at a function! The level of professionalism and quality of food and service was outstanding and we are so appreciative of how much was done to ensure the day ran smoothly. Many thanks to you and all your staff for the beautiful food and excellent service throughout the day.Your staff were friendly, hardworking and professional and with all at Gildredge Manor making our day perfect and very memorable!.. Just wanted to thank you all for such a great evening. As usual the food and service were fabulous as was your patience with us on the run up to the event and on the night! The way you do things is outstanding, you made the evening, thank you. You’re all brilliant and sensitive to situations, a rare find. Food Glorious Food delivered a highly professional service for our wedding in August. From start to finish Julia and her team listened to our requests and tailored our event for our guests. The food surpassed our expectations and was exceptionally high quality, as attested to by our guests. The meringue dessert was a huge show topper and gave the wow effect we wanted. Neil, as our event manager, was a sea of calm, patient, friendly and approachable. We will be recommending the Food Glorious Food team to all our friends and family and will be using them again without hesitation. Thank you very much, everything once again was perfect. We had so many lovely comments about the food, especially the desserts. It was a good excuse to forget diets and enjoy the bread and butter puddings and tarts!!! Please thank Hannah and all the girls from us both. They really did an excellent job and all looked great in their aprons and head scarves. I researched and had tastings with other caterers, I put a lot of time and effort into making sure we chose the right people as food at your wedding has to be spot on. No one compares to FGF that is no exaggeration! If they are on your list or possible caterers I hope this review will make the decision for you because you will not regret it!! David and I would love to thank you for the amazing food you prepared for us on Sat 5th May. We had many compliments about the food so wanted to pass that on. Your staff were superb can you please thank them for us. Can you also please let us know when our deposit will be repaid. We cannot thank you enough for providing the most wonderful service at our wedding in April. From meeting you last August we knew we had no need to worry about catering – you just seemed totally in control and your food was delicious. So many of our friends and family have told us how well ad thoroughly fed they were. Your whole team was friendly, professional and worked seamlessly to keep everything running to plan. Please let us know if there is somewhere that we can write a rave review. We hope you are able to manage some summer holiday amidst all the weddings. Thank you all so very much for your fantastic work on the day. Our guests still tell us about the wonderful food and how much the loved the ceremonial carving! It was just perfect! Thank you to all the team for Saturday- the food went down a storm and people are still talking about it now! Kirsty and I absolutely loved it! Neil was amazing, getting me a warm bacon nutty late that night because I hadn’t managed to grab one. Congrats on becoming a finalist of the caterer of the year at the food awards! We will keep our fingers crossed for you. I just wanted to write to say a huge thank you for providing such wonderful food for the Great Walstead Under the Sea Ball last Saturday. It was absolutely delicious and looked simply stunning. People have been raving about it and we are so pleased that we invited you to be our caterers. We were also very grateful to have the use of your fridge van, which made everything very simple. Please pass on my thanks to Steve, Hannah and the rest of the team too. They were brilliant. And the chaps who helped me to sort out the glasses on the Sunday were great too as it was not easy with the hangover I had! If there is another GW Ball in two years’ time, we will certainly recommend you to the 2020 Ball committee. I researched and had tastings with other caterers, I put a lot of time and effort into making sure we chose the right people as food at your wedding has to be spot on. No one compares to FGF that is no exaggeration! If they are on your list of possible caterers I hope this review will make the decision for you because you will not regret it!! Just a line to thank you and the team for making my birthday lunch yesterday so special. My guests were extremely complimentary about the food which was really delicious. Grace and Rebecca looked after everyone very well. They were professional and unobtrusive. I had a wonderful time made all the better by knowing how much my guests were really enjoying themselves. And,of course, Barney was very pleased to meet you. Clio and I would just like to say thank you for such an amazing day on Saturday. The food was unbelievable as we knew it would be but yourself and the whole staff were incredible and thank you for making it the best day of our lives. The amount of people coming up to us saying it the best food they’ve ever eaten at a wedding is something else and that’s all down to your hard work and dedication. We hope to see you soon and we’ll be recommending you to everyone. We just wanted to thank you all so much for such a fantastic evening! The food was absolutely delicious and we have had so many compliments on the catering from the canapés to the perfectly cooked beef and I don’t think there was a brownie left in sight!! The bar staff did a fantastic job too and Guy, Oscar and myself were able to just sit back and enjoy the evening knowing that you had it all under control which was wonderful. Please could you pass on our thanks to everyone at Food Glorious Food for making it all seem so effortless and seamless and we really look forward to using you again. We would like to thank you all for the superb catering you provided for us. This contributed enormously to the successful celebration of our Golden Wedding and Alan’s 80th birthday. The food was excellent receiving many accolades from our guests (several of whom took your contact cards). Every member of your team lead by Grace and Trudy were brilliant going about their duties with unobtrusive efficacy and always with a smile. We are back from honeymoon now and I just wanted to say thank you so so much for the absolutely delicious food at our wedding! It really was amazing, we had so many complements on the food, so yummy! I am back in California after our simply astonishing whirlwind weekend of assorted celebrations for Alexandra and Alex. The preparation and dinner the night before were really fun, the brunch was just perfect – allowing everyone a casual setting to just keep the party going, but the real success was the wedding reception and dinner. I can’t thank you enough for so quietly and efficiently making it all happen. I seemed to be so busy with the events of the day, and didn’t really get the chance to tell you and your key staff what a fabulous job you did. Maybe I looked at things a little differently from most guests, and noticed some details that I am sure just floated past everyone, but there were so many little touches that just made me know that we had made the best, and really very critical decision, in hiring Food Glorious Food. It was such a luxury to have a few days to get everything set up. And everyone was so nice about all of the last minute thoughts, such as changing the napkin fold, and upgrading the glasses to the higher end choice. And we certainly didn’t expect to have to bail out the tent delivery people from the mud – Chrissy’s people were fabulous too, and I will write her a separate note. And the food was just lovely. From the generous assortment of appetizers, (or appetisers over there) through each beautifully presented course, it was all delicious, local, and visually interesting. I know it’s not easy doing this in a tent, with no running water, and and your staff just made it all look effortless, which I know it isn’t. There should be some lovely pictures to follow when the official photographer gets back to us. I hope some of them will be useful for you. So, my highest compliments to you, and I wish I could just give you a huge hug. Many many thanks for making a day that is so important to our family, a perfect, stress free and delicious happy occasion. Thank you so much for catering such delicious food throughout our day. Everyone loved the lamb! Also your team made everything so smooth and relaxed we wouldn’t change a thing! Apologies for not penning this sooner but we’ve been swept up in post wedding indulgence! We just wanted to write to you thanking you for everything you did in catering for what was the best day of our lives. The carve at the table was such a hit with everyone and completely reflected the fun and atmosphere we were keen to pass on to our guests. As soon as the meal finished we were told by so many guests that the breakfast was the best they had ever had at a wedding. We completely agree and are so proud to have had this response from everyone. From day one we were impressed with the way you all conducted yourselves and were left in complete confidence that you would do an excellent job. The fact that your timings were so precise also left us able to meet our evening guests on time. Hannah was calm and totally in control and we were just so impressed with how it ran so smoothly leaving us to relax and enjoy the day. Altogether we would happily recommend FGF to anyone. Well, that is it for another year. The Festival is finished and the marquees are finally being taken down. I wanted to drop you a note of thanks for all your help with the Festival Dinner. Firstly, to your staff as they were all wonderful on the night. They were courteous to my guests, attentive to their needs, very efficient in serving and clearing, respectful of the speakers and polite at all times. They worked incredibly hard and are a real credit to Food Glorious Food. As for Hannah, well she was also superb. The Festival Dinner is always a nervous/pressured time for me as its my event, organised by me. So I’m often running around in different directions. But having Hannah there to keep me calm, act when I needed her to and keep the whole evening flowing from a catering point of view was amazing. She was a real star! I also have to thank you Julia, for your support of the event, your advice and guidance, and for producing such a sumptuous meal for our 150 guests. I have had no complaints only compliments on how much they enjoyed the food. You certainly delivered a truly memorable meal. These dinners are not the normal run of the mill event. We have the speakers, VIPs, table priorities, a demanding crowd and the timings are quite tight whether serving, clearing away etc. We also have to figure in the complexity of logistics – the site itself, set up of your marquee and the kitchen, and any cleaning away that night or the following morning. Therefore everything has to be perfect. Food Glorious Food delivered on all accounts and helped us to put on a fantastic evening for our guests. I could not have done this without you and would have no hesitation in recommending your company to others. If you could pass on my sincere thanks to your team who helped on the night and to Hannah as well, I would be very grateful. Thank you again Julia for all your help and here’s to 2018! Thank you and the team SO much! Yesterday was a fabulous success and everyone was just delighted. The food was wonderful and the service impeccable. Niki was fantastic – always seemed to be just there when there was something to check, has the right balance between informality and being professional and the team seemed to work brilliantly together. We were so grateful in the end that the bar was managed for us and again that was of course done perfectly as well as all cleared down. Almost nothing for us to do! So lovely to have the FGF experience as a guest. Thanks again so much & look forward to seeing you soon! Thank you so much for today. . completely seamless. It was lovely meeting you and Keith and the rest of the team. Your business is very appropriately named and each table was full of compliments for your delicious food. You were such a lovely, easy team to be along side. Congratulations on your well deserved award. We will have no hesitation in recommending you and hope that we can find an excuse to use your services again. The very best of good luck for your very busy schedule ahead. Thank you so much for all your hard work on our wedding day! It was an amazing day and you made sure everything went without a hitch – despite the bad weather! The food was beautiful and everyone said how much they enjoyed it. I’ve given your contact details to a couple of people! Thanks again and I hope you have a wonderful Christmas! Thank you so much for the fabulous food served at our 20th Anniversary dinner. The food was amazing and the service impeccable. We have received many thank you letters from our guests and all of them mention how much they enjoyed the food. Again thank you to you and your team for making a special night even better. Chris and I want to express our extreme thanks for everything you did to make our wedding day so tasty! The food was simply delicious and just like eating at a high end restaurant. Beautiful presentation and flavours, with such attention to detail with the wedding breakfast and reception canapés that there was not much left! Chrissie was fantastic as the event manager – so efficient and thought of everything on the day – even the things that we forgot and the catering staff were a credit to you. Every single one of our guests commented on the quality of the food and we will certainly recommend you if we can. I called yesterday to try to thank you for everything on Saturday but failed to track you down! The food and service were absolutely wonderful and I have already had several comments from guests praising it all, and particularly the lamb which was perfectly cooked. How you did that for so many people I have no idea! The starter was delicious and my risotto lovely and again perfectly cooked. You are all so professional and we truly felt that we were in very capable hands. I would like to thank Hannah personally. She was outstanding and could I have her email in due course please? Thank you so much for Food Glorious Food to what was a fantastic event on Saturday! All the feedback for the catering side of the event was overwhelmingly positive. The presentation, servers, choice and quality were all of a really high standard and it all helped create the “feel good” family vibe we were going for on the day – so thank you again. I know that I have spoken to you to thank you, but I just wanted to reiterate how pleased I was. You and your lovely team helped to make the occasion very special. So many compliments on your food. Thank you so much for the amazing food you made for our wedding at Wakehurst and for the wonderful service which made the whole day run smoothly. We had a very special day and so many of our guests commented on how tasty all of the food was. Thank you for helping to make it so lovely! Lew and I wanted to say the hugest thank you to you all for being so incredible during our wedding day at Wakehurst Place a few weeks ago. I’m so sorry this has taken so long to send – we were hoping for some photos of the food to come through from the photographer that we could include but we didn’t actually get any I’m afraid. I’m slightly gutted about this as it was truly incredible, and that dessert – wow! All of our guests loved it just as much as we did…we really can’t thank you enough. You were such a pleasure to work with both in the run up and on the day itself – and Hannah was an absolute superstar, I’m so sorry I didn’t get to say goodbye to her on the night. If you ever need any recipe tasters, you know where we are, we would gladly eat that meal every day of the week! I just wanted to thank you and your team (especially Nicky and Grace) for making out Silver Wedding Anniversary Celebration such a success. Our guests loved all the food and your attention to service was excellent. All in all we have a wonderful day and thank you so much for all your hard work. Thank you all very much again – delicious food and you helped to make a very happy and enjoyable event! Ray and i had a wonderful day on Sunday, thank you all very much. As usual the food was A1, we have had lots of lovely comments and all your staff worked so hard to make it a perfect party. A very belated Thank you for all your hard work and assistance on our wedding day back in May. We all really enjoyed the wonderful food.”best canapes ever” has been a recurring comment! The service from you and your team was perfect. You were all so friendly and helpful, and looked after us so well. Married life is treating us well and thank you for helping give us the best possible start. Thank you so much for helping to make our special day so amazing and for running it so smoothly. The food was exquisite and the service was fantastic. We were able to just sit back and relax and enjoy the day. Thank you so much for everything! The canapés, main meal and evening food were all absolutely delicious and cooked to perfection. I personally loved the rack of lamb. In addition, numerous guests commented on the day and subsequently on how fantastic the food as well as the attentiveness and high level of service of the staff who were well organised, so well done! We really can’t thank you enough for making the day so special, along with being so lucky with the weather, (and the ceremony!) you made the day one we’ll remember for a long time to come. I am hugely appreciative of your support on Sunday. I am so glad you received fan mail from the Air Ambulance. I have had nothing but praise for the excellent food. I think the choice of menu was great for such a large number and, as usual and as expected, Hannah and the front of house team were stupendous. It is always lovely to work with FGF. Being the first occasion of this kind at Folkington it really was quite demanding logistically and I had coerced so many friends into supporting me it was almost impossible to see everyone! The evening was a huge success financially and I think we have managed to spread the word about the good work of the Air Ambulance. My heartfelt thanks once again. I can’t thank you enough for all you and the girls did for us yesterday. The food was absolutely wonderful, and not only looked good, but tasted wonderful too. I could get used to having caterers, and amazed at how smoothly it all happened! Thank you, it was all superb. Wow sums our experience at FGF this past weekend! Julia and her team were phenomenal from start to finish, from the quote to the ‘no problem we can do that’, I felt at ease during the entire booking process and also on the day. Julia was in charge in the kitchen and Hannah in the room and I did nothing but just be a guest in their hands! They all worked seamlessly together and all our guests raved about how amazing the food was and how unobtrusive the servers were. All the team members were available at all times should we need help and the bar team were also great at letting us know how the levels of alcohol were going and dealing with all the specific needs of our guests! I cannot thank Julia, Hannah and her team enough for making our weekend the best one in our lives. We will rebook within a flash when we need catering again. Sorry I haven’t been in touch sooner… we went away straight after the wedding and just catching up with everything. 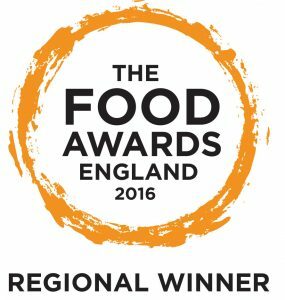 Just wanted to say a huge thank you to you, Hannah and the whole team at Food Glorious Food!! You made our wedding day so special and as always went above and beyond!! There are not enough words to describe our appreciation for everything you all did. Hannah was fantastic at front of house and I knew our wedding was in safe hands. Julia, the food was out of this world!!! Delicious!! All our guests have raved about how amazing the canapés and meal was. We had the best day and it was all down to our amazing suppliers. Thank you so much!!! Wish we could do it all again. Have a wonderful Christmas!! Hopefully see you all lots in 2019! A huge thank you for catering our wedding at the end of October. We had the best day, with thanks to your team! The food was delicious and we have received many compliments from our guests. Your team were great – so helpful and attentive, with special thanks to Hannah who made the day run so smoothly. We just wanted to share our thanks with you for our wedding at Gildredge Manor on 13th October. All the guests commented on the food and some said it was the best wedding food they’ve ever had! Everything was perfect and you both made us feel so at ease that there wasn’t a single worry on the day for us! The canapes were gorgeous, and the wedding breakfast was incredible, even the children ate their meals despite all the entertainment in the kids room and the service provided by all of your staff was so friendly, nothing was too much trouble and you happily catered for even the fussiest eaters! Thank you so much for contributing to our perfect day! Thank you so much for catering our wedding on Saturday. The food was out of this world! We were so impressed by your organisation and the quality of your food! It far surpassed any of our expectations. All the guys enjoyed everything your plated and many said it was the best wedding food they had ever had! Your chocolate brownie was sensational! The entire team were lovely and friendly and went above and beyond to make the day as perfect as it was. Thank you so much, we will highly recommend you to anyone who asks. It was a wonderful day from start to finish. We were so so lucky with the weather! We had some lovely comments about food, all your very attentive start and the very efficient Neil. A big thank you once again to you and all your team. Sonia and Chris had such a fun day and should now be relaxing in Italy, somewhere on the Amalfi coast. We just wanted to say again what a GREAT day we had. The team worked so hard and the service was impeccable. We not only thought so but we’ve had so many of our guests compliment the day as well. Feedback from all the tables about the food and the staff was unbelievably positive. Is there anyway we can leave a review for you? We cannot thank you enough for helping make our day run perfectly from start to finish. We didn’t think the food could get any better than what we tasted earlier on in the year but wow, it was all absolutely incredible. To hear all our guests rave about the food made us so happy – they really couldn’t believe how amazing it all was and neither could we. The service was impeccable and Hannah, we couldn’t have asked for anything more from you – you really were wonderful! We had the most perfect day so thank you again! You guys are amazing. The food is still being talked about, understandably so!! Thank you for making our day run so smoothly, we cannot recommend you enough. We just wanted to say a HUGE thank you to you, Hannah and all the team- the food was exquisite, the service immaculate and you were all so so amazing! The day went perfectly and a huge part of that is down to you all. We cannot thank you enough and will recommend you to everyone! Thank you so much for the amazing food and service at our party on Friday. We all had a fantastic time. You and your staff are warm, friendly and professional and we all felt very special at our party, which felt almost like a house warming! Everyone said the food was delicious and we couldn’t work out how on earth you produced it all in a field kitchen! Thanks also for clearing up a large proportion of our Christmas mess. Firstly we just wanted to say how wonderful the day was for us… the food and service were both first class and we haven’t stopped hearing from everyone who came that it was the best wedding food they have had! A special thank you to all the staff on the day who made everything feel so special and most of all meant that Nadia and I could simply enjoy the whole experience. We are not long back from a fabulous honeymoon in New York and sadly back to reality!! Many thanks to you and your team for helping make last night’s dinner such a great party. The food was delicious and service very good …. unobtrusive and efficient. All contributed to a very successful evening. Just a quick note to say thank you for your outstanding performance at Madelaine and Hugo’s wedding. Your staff, service and attention to detail is simply world class. We can’t thank you enough for making the day so special. Hugh apologies that it has taken me this long to send these photo’s over to you and thank you for the amazing day you and your team organised for us. We have had so many compliments from our guest about your food, service and what a wonderful day it was. From the first moment we met and tasted your delicious food I knew we were in safe hands, but the set up on Friday with Chrissy, Keith and Neil gave me so much confidence that everything was possible and completely organised. They were very reassuring, helpful and relaxed. Little stories I’ve discovered from guests of the lengths that were taken to accommodate people; keeping a meal hot whilst a guest had to leave for an hour during the main course, finding decaffeinated coffee for my mum, coming to the rescue with safety pins for a wardrobe malfunction and calmly putting up with the children playing chasing games through the kitchen! Then all the wonderful feedback about the food – delicious canapés – finding the right people for the vegan/vegetarian ones, so many compliments on the 2 fish courses, managing to serve everyone a piping hot main course – we just don’t know how you manage it, we thought perhaps you prioritised our top table until everyone else had the same perfect experience! Lastly the meringues – they were a complete showstopper – I enclose some of the professional photos, such a brilliant talking point for the guests, getting everyone together working out how to share them. It was all a huge success, we had the best day ever where all our friends and family were enjoying and sharing our special day and it felt that your team supported us through it from beginning to end, led brilliantly by the calmest Chrissy – she deserves special thanks. Thank you all so much. We couldn’t recommend anyone more highly. Denis and I cannot thank you enough for your incredible food and service at Bella and Dan’s wedding on Saturday. So many people came up to so to say they had never had better food at a wedding that we lost count. I was running on adrenaline most of the day, and even I tucked in to the delicious lamb and chive mash (missed the canapes, sadly – too busy greeting people). Puddings were exquisite. Nearly all the evening cheese was demolished, and I thank you most particularly for that very kind gesture. Where do we start? We are so,so,so grateful for everything you did for us both before and on the day of the wedding. From the food tasting to the last slice of pizza everything was seamless. We had the wedding of our dreams, everything we could of wanted and imagined, and such a huge part of that was because of you, Food Glorious Food. “Oh my god that brownie!” is all we’ve heard the last few weeks. But you’re so much more than the food and we were thrilled with everything! (Even offering to pencil-in a grooms eyebrows because he shaved it off the night before!) We’ll be sure to nominate you in any awards we see and I’m sure there’ll be many more to come in the future for you! I just wanted to say a sincere thank you for all your hard work on Monday and in the weeks leading up to the Ball – and of course please say a big thank you to all your staff as well! It was such a pleasure working with someone so experienced in catering for Jesus, with your food which everyone loves so much every year – the curry in particular received rave reviews from my friends I spoke to after the Ball. It was a fantastic night, with many commenting positively on the food in particular – I hope you and your staff enjoyed it too! Best of luck with any other events during the rest of this summer, and thank you very much again for contributing to such a successful night! We just wanted to say a huge thank you to all who helped make our wedding day as spectacular as it was, from the preparation planning to the day itself. Everyone was complimenting how delicious the food was and how everything flowed so nicely. Hannah you were amazing on the day. Guests thought you were Hendall’s contracted caterers so were amazed when we said you weren’t as you made it seem like you were always there which added to the smooth running of the day. We couldn’t have wished for a more perfect day if we tried! Thank you once again – we hope you have a lovely weekend. Just a few words to thank you personally, and of course the team on the night; for the magnificent supper you provided for my 50th Birthday on Saturday February 18th at our home address. I was over the moon with the food and beverage, and the excellent service that you engaged with Martyn, it really was superb in every way possible and people are still talking about it all, the living room looked amazing and you attention to detail professionalism and know how was spot on. Congratulations and a million thanks to the cake maker you engaged; the British Airways World Network was spot on, i should know after 26 years!!! Tasted like clouds in heaven too. The food was piping hot, served timely and appropriately, the canapes sufficient for all and superbly good, the quality and standard above and beyond, the team of servers always so polite, well groomed, courteous and friendly. Super stars all of you. Just to say thank you so much for all the wonderful food you prepared for our wedding. After our tasting session with you, Ben and I knew how delicious it would be but our guests were suitably impressed and singing your praises all night! Thank you to you and your team for making our wedding day the best day ever. The food was exquisite and the team were so professional. Have a wonderful Christmas and all the best for 2017! We wanted to formally write to say a huge thank you to you all for delivering such a fantastic service on our wedding day. Our family and friends have not stopped complimenting the catering, the canapes were a hit the sharing platters were a really fun way to kick off the wedding breakfast and a couple of guests have even admitted having two servings of desserts. Our favourite was the lamb which definitely suited everyone’s taste! You made the difficult decisions through the planing easy and we never felt a hint of pressure knowing we had you on board. Thank you for being so accommodating and kind throughout:) Your staff were beyond wonderful! We just wanted to drop you a message to say thank you so much for your very slick, fantastic catering on Saturday night. The food was absolutely delicious, and everybody I have spoken to since has said how great it was. I think also you did a few extra bits for people who don’t eat meat, so thank you very much for that too, very kind of you. We also wanted to say how lovely all the staff were, so friendly and efficient and nothing was too much trouble. I think they also sought out Jim to make sure he ate some food as well, also very thoughtful! It all contributed to making the party such a successful evening. Sorry I didn’t get to say goodbye – once the music is on – that’s me on the dance floor for the evening! Please do pass on our thanks to the team, and thank you very much to you too. You may be seeing us again in the future …..
We cannot thank you enough for the hard work you put into our wedding day. You were an absolute dream from the day we very first contacted you! You all worked so hard on the day and made it perfect. How you managed to serve such delicious food in the middle of a field – battling the rain, I will never know! We were completely blown away and so were all of the wedding guests. We received raving reviews on the day and people are still talking about the food at our wedding now! Thank you for the part you played in making our dream wedding vision become a reality! We cannot thank you all enough for the most fabulous catering you provided for Emma and James wedding at Gildredge Manor. The attention to detail, the fabulous food made it a day to remember for ever. All our guests were so amazed by the canapes and lovely meal. We’ve had so many compliments. If we can ever recommend you we will. All the staff were so efficient but friendly- just perfect and so ably directed by your daughter. There are no words to express our delight at the whole day! I just wanted to say Thank you so much for making our party on Saturday so very special. We were absolutely delighted with the whole experience. The food was superb, beautifully presented and tasted even better and definitely the best canapes I’ve ever tasted! Hannah and Victoria ensured we received every attention whist remaining totally unobtrusive. And a spotlessly clean kitchen after you left! We would be so happy to use your company again. Thank you for making our day perfect. Thank you so much for all your work in making our wedding so special. The efficiency and presentation was commented on by everyone. We appreciate you had lots of work to do turning the room around and you did a wonderful job. The staff were so professional and yet considerate-I was so happy to be regularly offered food and drink by some of the servers. I was so worried about the meals as I had quite a few vegetarians and people with dietary requirements and it all went smoothly. The food was simply divine and thank you for accommodating the Greek alcohol and almonds! Thank you so much again, we are just so happy to have had your expert help. Just a formal note to thank you for the delicious food and first class service at our wedding in the Seed bank at Wakehurst on 3/10/15. You were mightily helpful before and during the event, and everyone commented on how lovely the food was – perhaps especially the canapes and desserts! Your staff team were brilliant and all in all it was and amazing day. Thanks for your part in it. Julia, it was just wonderful, amazing, and perfect in every way. Can’t thank you enough. I wanted to get in touch on behalf of Ash and myself and all of our family. We could not be more happy and thrilled with the outcome of Saturday. Several people told us that the starters were the best canapes that they had ever had! The main course was absolutely delicious. The aromatic spices and flavours of the curries were absolutely spot on. Several of the tables, as you know were filled with Indian people who had travelled from all of the the UK, America, Dubai and India and they all loved the food. They of course added the extra chilly to taste. The Irish contingent from my side of the family also loved the food and the level of heat and spice was just right for them. So everyone was catered for perfectly! All in all everyone was so impressed with the food. I gather that several members of both sides of the family came to speak with you to personally thank you as they were just so impressed on the day. The deserts were a big hit too. Everyone was so impressed with the buffet style desert tables and that they had a choice of what to have. People were also raving about the fish and chips and cheesy chips and I gather that lots of people ate them too! Your staff were very friendly and professional and looked very smart. I would like to extend a big thank you to Hannah. She was so kind and friendly and I felt that my every request in the planning the day before and on the day was listened to and action was taken. Hannah remained calm and smiling throughout the day and was a pleasure to have there. I hope that you both took the wine and champagne that I suggested you take and that all the other staff took a drink or two at the end. I could not recommend you more highly. You listened to my every suggestion regarding the planning and the food itself. I can imagine as a British chef taking advice from two Indian ladies must be very daunting but you were so accommodating and on the day it was perfect! If you ever need a testimonial please feel free to use these words or ask for some others. It was a pleasure to work with you and your team and best of luck for future events… not that you need it! I am writing to thank you personally for the wonderful canapes and dinner you produced for Musicals at the Manor event. The food was delicious, the waiting staff impeccable and I heard a number of guests comment on how wonderful the food and service was. Hayley, my wife, and I are lucky enough to go to a number of events but rarely is the food of such a high standard and so enjoyable. I was speaking to someone (I’m afraid that I can’t remember his name) as we were going into the show who said he had been sitting with someone who is a restaurant critic and who greatly rated your food – fine praise indeed! Although we do not yet have a final figure for the amount raised, indications are that this event was not only a resounding financial success but also afforded us the opportunity to reach out to new potential supporters, the impact of which is unmeasurable at this stage but I am sure will be of enormous benefit to the Kent, Surrey & Sussex Air Ambulance. I hope you feel very proud to have contributed to this marvellous event. Thank you again from everyone at the air ambulance and more importantly from the patients that we will be able to attend and help as a result of the evening.